"New Publication - DLC Diamond Like Films Needle" (03) - Triumph Needle Corp.
"New Publication - DLC Diamond Like Films Needle"
deposition to deposit on the surface of the base material and forming an thin film layer. friction coefficient is smaller than 0.2, which is much better than other plating films. 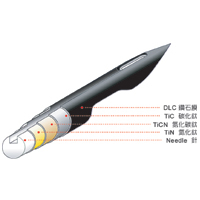 Charts on the right are the comparison of "DLC" diamond like films needle and other needles.